Not many people know this, but my first entrepreneurial business when I was 28 years old was as a snail farmer! I was so excited! I joined the Snail Farmers Association of America. My company was called Texcargo (a play on the word Texas and Escargot) and my mission was to supply fresh, live, happy snails to the best restaurants in town. Possessing few carpenter skills, I nevertheless managed to build a snail corral to contain my little slimy beasties, and went to work gathering the perfect snails for my collection. I worked very hard to create the perfect environment and foods for them to flourish and multiply. And multiply they did. I soon had tiny bb sized snail babies climbing everywhere! I planned their diets carefully, made sure they were happy with lots of things to do including a tiny little jungle gym made out of tree branches, plants and herbs. I began talking to restaurant owners, and lined out contracts and timelines for their delivery. Unfortunately, all my grand plans came to naught when I began communicating with the cute little critters. I got to know them and started playing with them… When I started naming them, I realized I just didn’t have the heart to… well, eat them. Shortly after that, my charges figured out how to escape their corral. In spite of my best efforts to herd them back in their corral, I was unable to round them up. So in retrospect, I’m happy to say I never got my snail farm off the ground. To this day, I still have a very soft spot in my heart for the sweet natured, tiny but big hearted little creatures. We leave large footprints wherever we go, whoever we are, whatever body we are disguised inside. It’s sharing our heart that makes a difference – for ourselves and those we are here to serve. My lifelong, heart inspired goal is to be consciously aware of the world around me, to be open and connected, and to feel and express even more love for you and your animals than ever before. Will you join me in following your passion, sharing your blessings, and loving, touching and changing the lives of the souls you are here to serve? Remember other species have voices, feelings, wisdom and divine Spirits just like we do. They need us to be able to hear them, to recognize, respect and revere them. Ultimately they can be our best teachers if we know how to learn from them. If you also want to help animals live better, happier and healthier lives, then there are 2 things you can do right now. Second: If you have a Powerful Sense that YOUR pet needs to tell you something, then Apply for a Complementary Discovery & Strategy Meeting Now. For a limited time, I have a few new openings to help folks who are serious about improving their animal’s health, behavior and understanding. 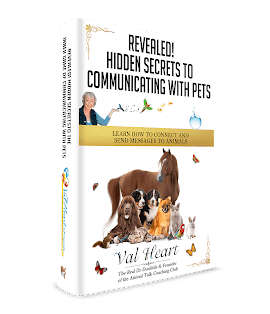 Gaining more clarity on what you really want from your pet, what’s in the way and together creating a plan to get you where you want to go IS the first step in solving any problem. Often changes occur simply by doing this one thing. Claim Your Complementary Relationship Rescue Discovery Meeting – Click the link and fill out the short application. If you’d like to experience breakthroughs you’d never expected, insights, healing, entertainment, enlightenment AND wisdom from your master teacher disguised as an animal, then now’s the time. P.S.S. Prefer a Done For Me solution to solving behavior or health problems, or improving performance? Let’s talk about it! Apply For a Complementary Relationship Rescue Discovery Meeting – Click here and fill out the short application.